The beauty industry in the Philippines is rising with stable growth. From makeups, to cleansing products, to natural and homegrown labels, the cosmetics industry has a bright future and is becoming an important part of the country’s economic growth. This is why Transportify Philippines strives to give an excellent logistics service to our clients in the cosmetics industry through effective and safe handling of cosmetics deliveries. There is a wide range of cosmetic products sold in the Philippines and most of them come from different countries, from Korean beauty products to acclaimed international makeup brands, which is why shipping could be a headache for business owners. But those who had a fair share of problems in shipping bulk orders could always count on Transportify car for delivery services. Additionally, beauty events are on the rise, giving different brands the opportunity to display their products and stand out from the crowd. Events always come with nitty-gritty planning and last-minute adjustments. Good thing Transportify delivery app is always available to lend you a hand. Transportify’s economy vehicles are suitable for delivering small-sized beauty products that will not exceed 200 kilograms. Car models in this option include sedan, hatchback, and MPV/SUV. For larger and heavier packages, online shop owners can opt for the L300 or closed van options which are perfect for wholesale product deliveries. The demand for beauty products is not expected to slow down any time soon. It will result in increased product orders and more customer delivery jobs. This is where Transportify’s express parcel delivery comes in as we respect our client’s time by fulfilling delivery requests on schedule. Moreover, online shop owners who get urgent delivery requests can deliver their products on the same day they were ordered through Transportify’s same day delivery service. This way, business owners can spend less time worrying about your deliveries and more time in growing your on-demand business. Emerging beauty trends have led online beauty shops to surface and get customers not just in the Metro, but also in the provinces. 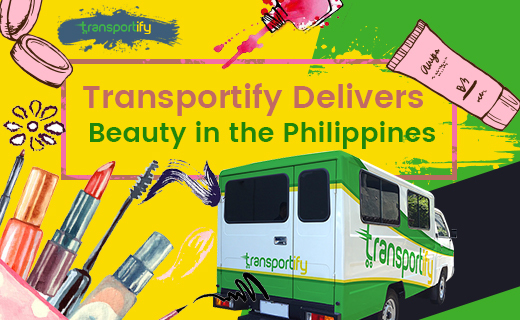 As part of our goal to revolutionize the Philippine logistics, Transportify has a wide service area that extends to the provinces near Metro Manila, which is why online shop owners who need to make special deliveries to the province can try Transportify’s affordable provincial courier service. Get in touch with our customer service representative to know more about our cosmetics delivery service or browse through our blogs to discover how we ensure quality deliveries. Owners of cosmetic businesses can worry less about delivering their products because they can always count on Transportify’s reliable cosmetic deliveries, range of delivery vehicles, express service, and wide distribution reach.